Did you know? Cultural Tibet extends far beyond the TAR, or Tibetan Autonomous Region! Now part of modern day Qinghai, Gansu and Sichuan provinces, the traditional Tibetan region of Amdo encompasses a large area from the Machu River (Yellow River) to the Drichu river (Yangtse River) and is home of the birthplace of the 14th Dalai Lama. Amdo Tibetans’ traditional lifestyle and economy is centered on agriculture. Depending on the region and environment they live in they are either nomads (Drog pa) or farmers (Sheng pa). Amdo was traditionally a place of great learning and scholarship and contains many great monasteries including Kumbum Jampa Ling (Chin. Ta’er Si) near Xining, Labrang Tashi Khyil south of Lanzhou and the Kirti Monasteries of Ngaba and Taktsang Lhamo in Dzoge County (Ch: Ruanggui /Zoige Xia) For the adventurous traveler, Amdo is wonderful wind-swept and tree-less environment, supporting vast herds of domestic yak as well as many types of wildlife. No permits are required for independent travel in the Amdo region. A historical region of Tibet covering a land area largely divided between the present-day Tibet Autonomous Region (bordered by the Yangtse River) and Sichuan province to the east, with smaller portions located within Qinghai, Gansu and Yunnan provinces of China. The Kham has rugged terrain characterized by mountain ranges and gorges. Numerous rivers, including the Mekong, Yangtse, Salween and Yalong Jiang flow through Kham. Known as Khampas, the people of Kham were reputed warriors renowned for the horsemanship and markmanship. Kham is a fascinating region to travel with remote communities, monasteries, wilderness regions and a tumultuous history. No permits are required for independent travel in the Kham region. Ü-Tsang is one of the three traditional provinces of Tibet, the other two being Amdo and Kham. Geographically Ü-Tsang covered the central and western portions of the Tibetan cultural area, including the Brahmaputra River (Yarlung Tsangpo) watershed, the western districts surrounding and extending past Mount Kailash, and much of the vast high altitude Changtang plateau to the north. 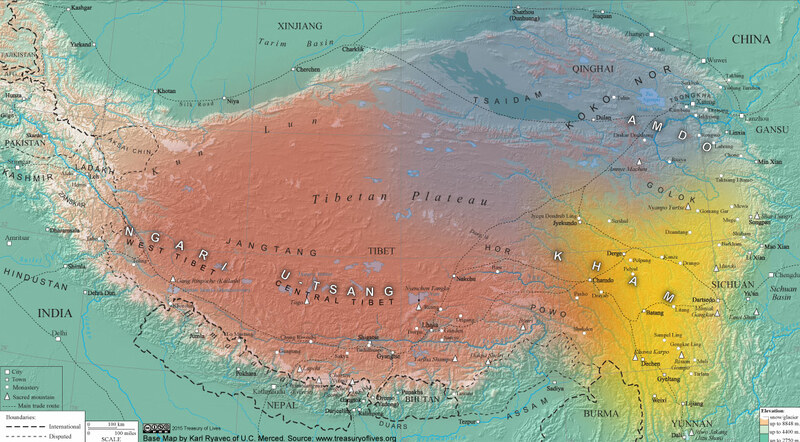 The Himalayan range defined Ü-Tsang’s southern border. The present Tibet Autonomous Region (T.A.R.) corresponds approximately to what was ancient Ü-Tsang and western Kham. Ü-Tsang was formed by the merging of two earlier power centers: Ü in central Tibet, controlled by the Gelug lineage of Tibetan Buddhism under the early Dalai Lamas and Tsang which extended from Gyantse to the west and was controlled by the rival Sakya Buddhist lineage. Ü-Tsang is the cultural heartland of the Tibetan people. Successive Dalai Lamas have ruled Tibet from the Potala and Norbulingkha palaces in the capital Lhasa. The Jokhang temple, perhaps the most holy temple in Tibetan Buddhism, is also located there. Foreign travelers to the T.A.R must adhere to strict rules that include applying for an entry permit through a registered travel agent and engaging the services of a certified guide and approved tourism transport. No independent travel is allowed in the T.A.R. Ngari is the far western prefecture within the Tibet Autonomous Region. Commonly referred to as “western Tibet”, Ngari is a vast high altitude region mostly above 4500m elevation and situated some 1600kms west of Lhasa.